Navigation without a GPS or without a map and compass will never be an exact science, but if you have an understanding of nature with regard to the ways in which it can help you with direction, it can mean the difference between life and death. It’s very useful to learn these skills in case you lose your belongings on route and need to rely on nature and the celestial bodies in the sky to help you find your bearings. You may find that you have a map but you have no compass but know that you need to travel in a straight line from Point A to Point B. The best way of doing this is to break the route up into smaller manageable sections and then choose two landmarks ahead and line them up and then do the same thing looking back. You may not see any natural landmarks so you may need to get creative and invent some that you can identify. If a constant wind is blowing in one particular direction, you can also keep a straight line by making a mental note on an area of your body upon which you can feel the wind blowing most intensely. Therefore, providing the wind direction doesn’t change, you can be certain that as long as you can still feel the wind on the same part of your body, you are almost certain to be walking in a straight line. Also, if the wind feels cold, it will generally be blowing from the North and if warm, it will be blowing from the South. The sun, moon, stars and planets all play a role in celestial navigation and before the advent of technology; sailors learned how to navigate their ships even at night time by relying on this method. Although it can’t be 100% accurate, it can give you a good indication of the general direction in which you’re heading. Remember that the sun always rises in the east and sets in the west. When it reaches its highest point at noon, its direction will be true south in the northern hemisphere. The North Star determines a northerly direction in the northern hemisphere and although it’s not the brightest star, it’s important because unlike the rest of the stars in the night sky, its position remains fixed so if you follow it, you know that you are heading north. By being able to locate much more recognisable constellations on a clear night such as the Big Dipper (shaped like a one handled wheelbarrow) and Cassiopeia (shaped like the letter ‘W’), you’ll find it much easier to locate the North Star and it’s useful to do some research on maps of the night sky to aid you with navigation by the stars. Because the moon simply reflects the sun’s light and produces no light of its own and because of what we know about the sun’s daily pattern, we can also use the moon for direction at certain phases of its monthly progress. If it’s in a crescent phase, simply draw an imaginary line between both tips of the crescent and on downwards until you reach the horizon. The point where it touches the horizon is approximately South in the northern hemisphere. And, if the moon rises before the sun sets, the illuminated side will be west but if it rises after dark, the illuminated side will be east. If it’s cloudy or overcast, however, you’re going to need more than celestial bodies in the sky to help you find direction and you can get some assistance from things that grow on the ground. For example, in the northern hemisphere, flowers and plants will tend to grow facing either south or east. 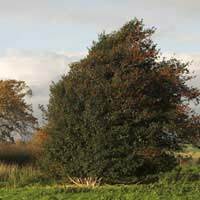 And, if you know something about the prevailing winds in the area in which you’re situated and can see a general trend in the pattern of how the trees are leaning, that will have been due to the wind so if you know the direction of the prevailing winds, you’ll be able to establish your direction. There are other ways of navigating without relying on a GPS or map and compass. Building a sun dial, designing a shadow stick or using a simple pocket watch are just some other ways which can help you find direction although, in a survival situation, you’re most likely to only want the quickest methods of gauging direction and in most cases anyway, you’re likely to only want to stay put until help arrives.